Hot off the press from Switzerland. The perfect luxury road trip with Edel and Stark. Switzerland Tourism Via Luxury Car? Yes please! Switzerland tourism is booming right now and it’s not hard to see why. With fresh mountain air and breathtaking views around every corner, this country ranks as one of my top 3 favorites. Now, let’s talk about how to move around the country and what should be seen. For starters, I recommend renting a luxury car. Comfort first! Plus, having the freedom to be on your own timetable, making stops at every jaw-dropping spot along the way, is priceless. 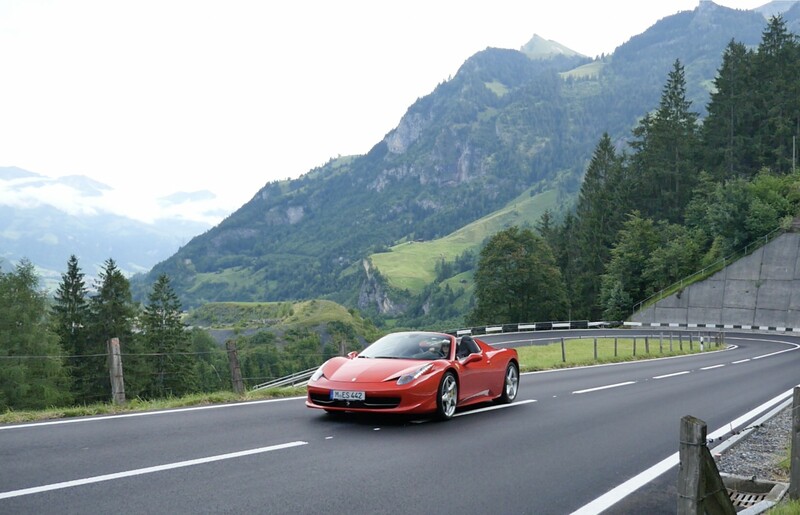 This is why I’m going to tell you about my three favorite drives in Switzerland and what you can expect to see there. If you’re like me, a one hour drive can easily turn into a three hour drive. Generally speaking, I like to stop and enjoy all pretty scenes. However, this can make for a long day, because in Switzerland, breathtaking scenery is omnipresent. Witnessing all of this beauty in a luxury convertible makes for quite the experience. 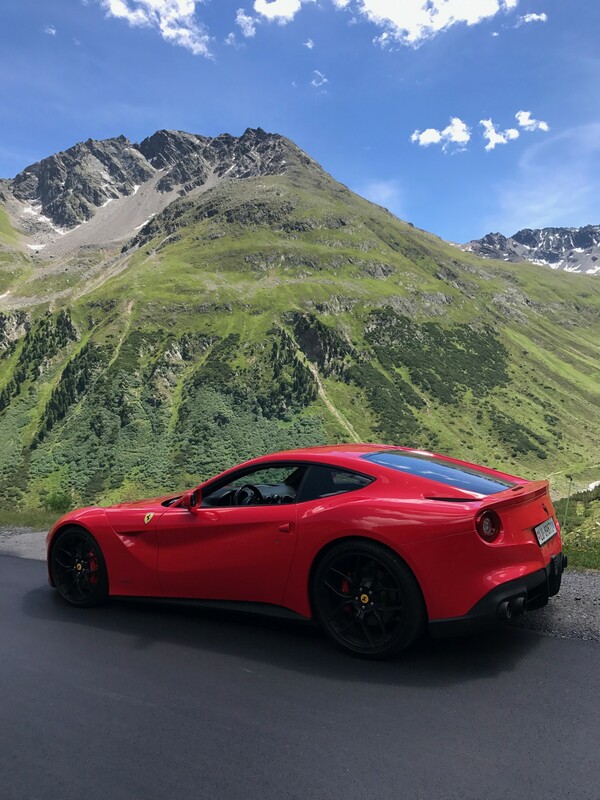 For these reasons, I rented a Ferrari from Edel and Stark, a company that offers unique mobility services in Europe and Dubai. This winding alpine road made an appearance in the James Bond Film, Goldfinger. It’s not hard to see why Furka Pass was chosen as the backdrop for a cinematic drive. It is spread out across a towering mountain range and in the summer is super fun to drive because of all the switchbacks. Multiple waterfalls cascade through the mountain scenery, and wildflowers are everywhere. Plus, an abundance of hiking trails curve their way through the area. Furthermore, you should not miss seeing Rhone Glacier, which is right when the summit of the pass starts to decline. The Rhone Glacier slopes down the mountainside into a turquoise alpine lake. Then the lake pours down over the cliffside creating a waterfall. This scene is somewhat unbelievable to witness. After all, where else can you see a glacier, a silvery-turquoise lake, and a waterfall plunging down into a massive valley? The best part? There is an ice cave underneath the glacier that you can walk through. For your Furka Pass adventure, stay at the swanky Chedi Andermatt, in the charming little village of Andermatt. Have lunch at the top of Furka Pass at Hotel Restaurant Tiefenbach. When you dine here don’t forget to check out the pink and purple lupine garden growing along the hillside. Dinner at the Chedi Andermatt cannot be beat! Make sure to make a stop in their floor to ceiling cheese room! Driving through Grimsel Pass, it was hard not to wonder if I had been transported to another planet. Not many Switzerland tourism companies will highlight this area but it is unbelievable. The silvery mint color of the lake that graces the backdrop is seemingly unreal. The road ascends through a series of wildflower covered canyons and mossy alien-green colored grass. A waterfall pours over the rocky mountain cliffside right into the otherworldly lake. The road is in perfect condition and makes for a really smooth drive. There are few other cars on this road, making it the perfect place for driving a little more adventurous than normal. There is another lake at the top of the pass, darker in color, with a few bright colored buildings at the top. This part reminded me of a scene from Norway. If you’re looking for a place to dine, Restaurant Hotel Grimsel Hospiz has breathtaking views and great food to boot. It’s also a good place to stay if you want to spend some time exploring the area. If photography is your thing, prepare yourself for paradise! First and foremost, the drive from Davos to Stelvio has been named the greatest driving road ever. That’s a big title to live up to, but this drive did not disappoint. In other words, I found myself smiling from ear to ear as I coasted through picturesque villages, green mountain ranges, and zigzagging roads. Apparently, I wasn’t the only one excited about driving this road. There were all sorts of luxury cars from Ferraris to Lamborghinis, and everyone was racing around those curves in pure enjoyment. Moreover, staying at the Grand Resort Bad Ragaz could be the perfect start to your scenic drive. About 3 hours later (or more depending on if you make stops) you can cross through the Italian border and stay in Bormio. I know I am writing about Switzerland tourism here, but spending a night or two in Italy isn’t the worst idea! In fact, you can stay at the Grand Hotel Bagni Nuovi and enjoy some spa treatments and delicious Italian dining! Furthermore, Stelvio Pass is just across the Swiss border in Norther Italy. It is the grand finale of this shockingly beautiful drive, which I recommend be broken up into multiple days. This is a sponsored post on behalf of Edel and Stark, but the opinions expressed in this article are entirely my own. Woderfull driving and Pictures, I want to be there….!!!! !